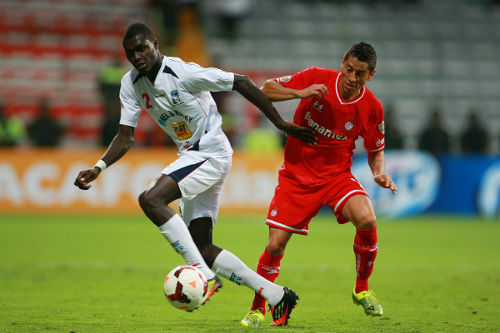 Caledonia AIA began its 2013 CONCACAF Champions League campaign with a loss away to Toluca last night but the “Eastern Staillions” might take some comfort in an away goal and a salvageable deficit as they fell 3-1 in Mexico City. Toluca plays 8,793 feet above sea level and Mexico’s 2012/13 runner-up is already four games into its new season while Caledonia is still three weeks from kick off in the local Pro League. So, although the Stallions were unlikely to have felt pleased at the final whistle, the flight home might allow Caledonia time to reflect on a far from miserable showing at the start of its second successive CONCACAF campaign. 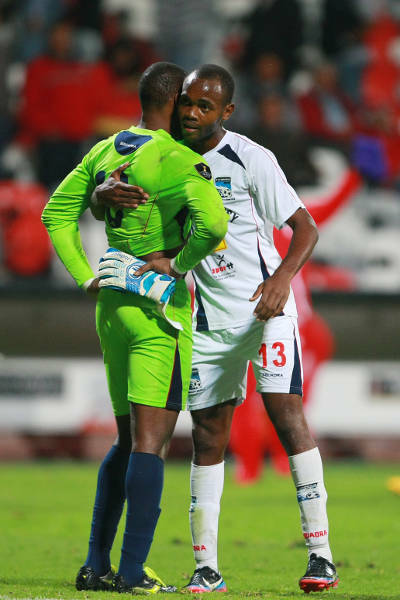 Photo: Caledonia AIA goalscorer Julian Wade (right) hugs goalkeeper Glenroy Samuel after a 3-1 loss away to Toluca. Still, Caledonia began with a similar 3-1 defeat away to US Major League Soccer (MLS) team, Seattle Sounders, last year but never got its campaign in gear and ended with just one point from four group stage matches. In 2013, coach Jamaal Shabazz must get his men to cross the gap between battling defeat and narrow triumph. Against Seattle, Caledonia conceded three goals within 24 minutes in a frantic first half. 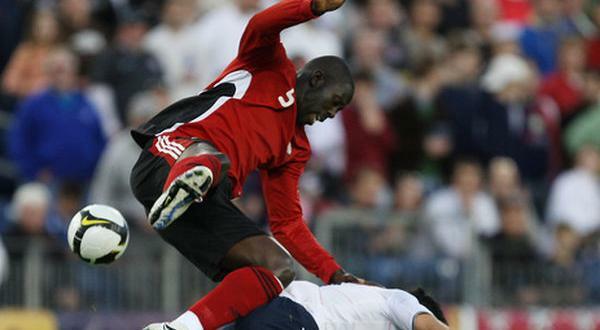 Yesterday, former Trinidad and Tobago 2009 Under-20 World Cup goalkeeper Glenroy Samuel was beaten twice in six minutes as Toluca looked like running riot at one point. 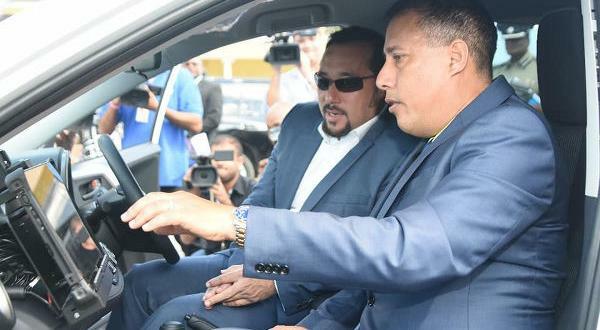 Paraguay international striker Edgar Benitez opened the scoring in the 23rd minute as he ghosted behind Caledonia debutante defender and Guyanese international Jamaal Smith to tuck past Samuel. Six minutes later, 31-year-old Toluca defender Miguel Almazan, who has 11 years as a top flight Mexican professional under his belt, doubled the “Red Devils” advantage with a curling free kick that left Samuel stranded. 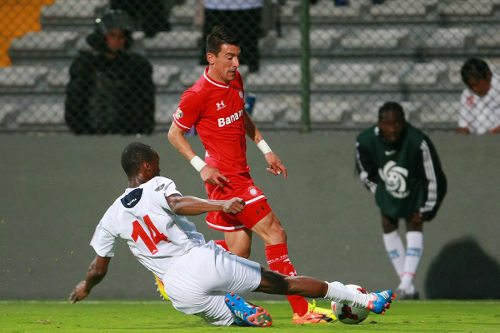 Photo: Caledonia AIA defender Jamaal Smith (left) lunges in to tackle Toluca striker Edgar Benitez. 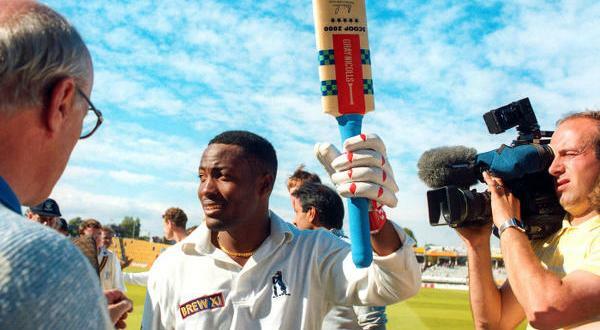 It did not help that the Caledonia wall stood transfixed as the ball flew an inch over the head of attacker Andre Toussaint. The Stallions regrouped at the interval and might have halved the deficit through a powerful Keyon Edwards drive, which Toluca goalkeeper and Mexico’s reserve international Alfredo Talavera tipped on to the bar. But the host team helped itself to a third item after an hour as 22-year-old striker Raul Nava made the most of ricochet off Smith to steer past Samuel. There was a touch of good fortune too about Caledonia’s lone item. 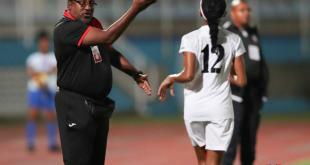 But the move itself was unmistakably part of the Trinidad team’s DNA. 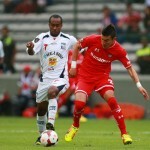 Photo: Caledonia AIA defender Aubrey David (left) and Toluca attacker Carlos Esquivel fight for the ball. A few exchanged passes in central midfield allowed left back Aubrey David to sneak into an advanced position and the 2013 Gold Cup player sent a low raking cross into the opposing penalty area. Toluca sweeper Aaron Galindo swung and missed. 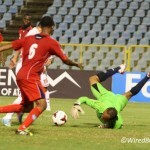 Caledonia substitute Julian Wade had just a fraction of a second to react and the 22-year-old Montserrat striker caught it well with a first time drive that flew between Talavera’s legs in the 87th minute. Fellow Pro League outfit, DIRECTV W Connection, will surely raise the curiosity of local football fans after registering five Colombians, two Brazilians and an Italian player for the new season. Let it be known that the young man from Montserrat, ranked 177th in the world by FIFA, opened his account first. 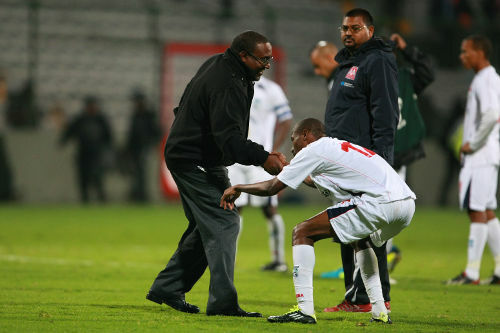 Photo: Caledonia AIA head coach Jamaal Shabazz (left) helps defender Jamaal Smith to his feet while assistant coach Rajeesh Latchoo looks on. 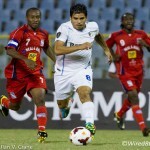 Connection kicks off its Champions League campaign tomorrow on Thursday August 8 against CD Arabe Unido in Panama. Caledonia will be at home for its next fixture, which is against Guatemalan team Comunicaciones FC on Thursday August 29. Anything but a win for the Stallions will erase any trace of the solace offered by yesterday’s late goal in Mexico City. 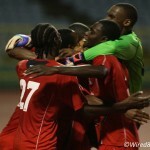 Caledonia AIA (4-3-3): 33.Glenroy Samuel (GK); 12.Kareem Joseph, 3.Nuru Muhammad, 14.Jamaal Smith, 2.Aubrey David, 21.Densill Theobald, 7.Stephan David, 20.Noel Williams (13.Julian Wade Jnr 70), 9.Keyon Edwards (11.Abdallah Phillips 78), 10.Andre Toussaint (27.Nathan Lewis 53), 23.Jamal Gay. Unused substitutes: 1.Shemel Louison (GK), 5.Akeem Thomas, 6.Marcus Ambrose, 22.Miguel Romeo. Deportivo Toluca (3-4-3): 1.Alfedo Talavera (GK); 20.Miguel Almazan, 8.Aaaron Galindo, 2.Francisco Gamboa; 18.Xavier Baez, 19.Edy Brambila, 15.Antonio Rios (21.Gabriel Velasco 58), 26.Erbin Trejo; 23.Edgar Benitez (10.Sinha 71), 11.Carlos Esquivel, 29.Raul Nava (25.Daniel Gonzales 76).